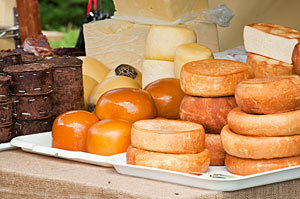 All kinds of cheeses, cold cuts and vegetable spreads. A traditional drink enjoyed with appetizers is " ţuică " (a potent plum brandy) which varies in strength, dryness and bouquet according to the production area. "Ciorbă de perişoare" (meatball soup), "ciorbă ţărănească " (vegetable soup, with or without meat), "ciorbă de burtă " (tripe soup). "Saramură " (grilled carp in brine), "Nisetru la Grătar " (grilled Black Sea sturgeon) or "Scrumbie la Grătar " (grilled mackerel). "Tocaniţă " or "tochitură " (meat stew seasoned with onions and/ or spices), "ghiveci " (over 20 vegetables cooked in oil), "sarmale " (pickled cabbage leaves stuffed with a mix of minced meats, rice and spices) and "mititei " (The "Wee Ones" - small skinless grilled sausages) are among the favorites. "Papanaşi " (cottage cheese donuts, topped with sour cream and fruit preserve), "clătite cu brânză " (crepes filled with cottage cheese, raisins and spices) and "cozonac " (traditional holiday sweet bread filled with walnuts, poppy seeds or cream cheese). Cheese and tree bark don't seem like a natural fit. 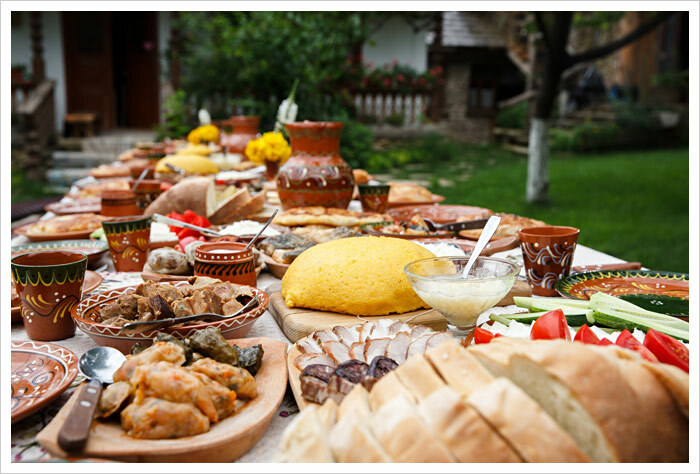 But this specialty of southeast Transylvania, especially in the towns and villages that include Moeciu and Fundata, may go as far back as the 14th century. Dairy farmers needed a way to store the surplus cheese, and the local evergreen forests provided the perfect vehicle. After all, woody bark provides wonderful protection for trees. Strip the bark from a fir tree, wrap it around the cheese and presto: the dairy product remains moist and preserved from the elements. Little Romania in lower Manhattan was a neighborhood within a neighborhood, tucked into the blocks bound by East Houston Street, Allen Street, Grand Street, and the Bowery. When the Romanian-born writer Marcus Ravage arrived in New York in 1900, he found the area thriving; restaurants had opened everywhere, he recalled in a memoir, and the first Romanian delicatessens were displaying "goose-pastrama and kegs of ripe olives". "Goose-pastrama" was the starting point for American pastrami. The Jewish immigrants who settled in Little Romania brought with them a traditional technique for preserving goose by salting, seasoning, and smoking the meat. In America, however, beef was cheaper and more widely available than goose, so pastrama was made with beef brisket instead. Later the name became pastrami—perhaps because it rhymed with "salami" and was sold in the same delicatessens. By the time Little Romania dispersed in the 1940s, New Yorkers from every ethnic background were claiming expertly sliced pastrami as their rightful heritage. Transylvanian Treats: One Sweet "Cylinder"
A long rope of sweet yeast dough is tightly wrapped in a spiral around a wooden form, something like a rolling pin,and dusted with sugar.It is then baked, slowly turning, on a rotating spit above an open flame. 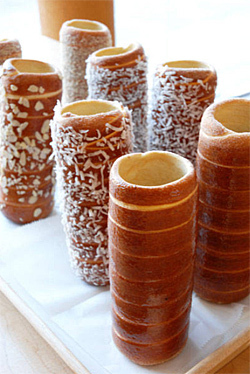 Carefully edged off its wooden mold after baking, each chimney cake is a whimsical-looking, soft bread with an addictively crunchy caramelized sugar crust and an airy open center. Anna Kozma, who hails from Romania, said this special-occasion cake (called kurtoskalacs, or chimney cake) was just a provincial treat until after the fall of Communism, when entrepreneurs began opening city shops in Romania, Hungary and elsewhere in Europe. Now, at her Chimney Cake store and cafe in Long Island City - Queens, Ms. Kozma makes everything by hand, in an open kitchen in plain view, introducing a whole new population to the pleasures of these tubular treats that look like giant empty cannoli. She makes an old-fashioned sugar-dusted version, of course, but her menu also includes variations from cinnamon to crushed walnuts to chocolate shavings. They are best eaten, fresh, by breaking off pieces. 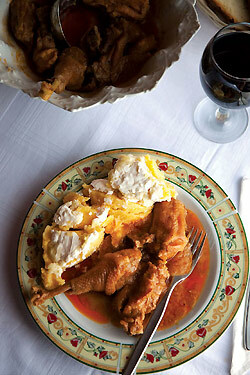 Bucharest – Romania's capital city – is changing at a fast pace and its dining scene is evolving, too. New or relatively new restaurants of note include Loft, a modern restaurant and lounge, Lacrimi si Sfinti, Bistro Jaristea and Zexe (the last three offer traditional Romanian cuisine). A hundred years-old printing house, located in Bucharest's central area, has been recently converted into one of the most acclaimed restaurants in Romania: LOFT. Modern design, high-class cuisine and 'cool people' are the attributes which are usually associated with LOFT – Bucharest. Drinks are in plain sight behind a 50-foot long bar. If you will be intrigued by the big white chandelier hanging above the bar: is the signature statement of the owners who have a long tradition in the restaurant and club business. Perfectly positioned in the centre on Romania's capital city – Bucharest, a short walk from the Romanian Athenaeum and Romania's National Art Museum, Bistro Jaristea offers good Romanian urban cuisine, an award-winning wine list, and attentive service in a setting that recreates the atmosphere of Bucharest on the 1930's, when the city was nicknamed The Little Paris. 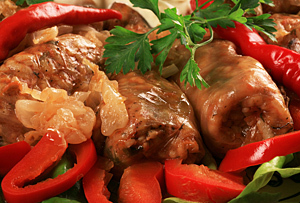 Traditional Romanian specialties include chicken meatball soup, Zacusca (seven-vegetable spread), smoked cheese and bacon roulade, duck leg with cabbage, duck breast with Ratatouille, Sarmale (cabbage rolls), Grilled Carp in Brine, leeks and olive stew. The prix-fixe lunch includes a soup, entree and dessert for $9.00. The newest – and environmentally-conscious restaurant in Bucharest - Romania's capital city has recently opened its doors! The restaurant's designer has spared both trees and feelings with his responsible wholly-salvaged timber policy. All the wood used had to pass an age test before it was eligible to become part of the rustic yet sophisticated interior. Abandoned houses, a village store and a few old barns were among the structures picked apart to provide the materials for this Bucharest restaurant, which has a homely feel from the furniture and features, and adds coziness to the dining rooms. 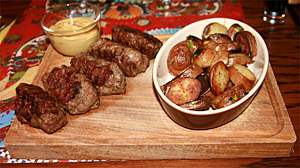 Many traditional dishes have been renamed to remember the old times: Frivolous Danube Mackerel, Balkan Eggplant Spread, Long Way Salad, Pick Me Up soup (sour soup with 'unnecessary' bits of goose, duck, turkey and rooster), "Sentimental' Catfish, Old Fisherman's Brine, 'Accorded' Sausages (made from goose, veal and pork), Noah Baked Beans (smoked goose and beans), 'Turkey Sentry', 'Good Weather Veal'. The wine list includes native wine varieties such Tamaioasa (a naturally sweet or semi-sweet white wine with subtle honey and basil aromas, an exquisite amber color and a persistent rich taste; its sweet taste may also suggest a blend of rose petals and wild berries) , Feteasca Neagra (Semi-sweet, medium bodied, light red wine, with original aromas), Feteasca Alba (Semi-dry white wine, well balanced, with a distinct aroma reminiscent of the first flowering of the vineyard) and Cadarca (this native variety , displaying a ruby-red color with a stinging taste of fresh clove, was the wine of the imperial court of Vienna during the reign of Emperor Franz Josef, in the 18th century). Just North of Bucharest, I left this century behind, and an hour later, the last one fell by the wayside, too. As I slowed the car to turn onto a dusty country road, a farmer in blue serge overalls stopped pitch-forking freshly scythed hay just long enough to give a wave, and the honeyed scent of linden flowers wafted in through the open car windows. to walk its fields, to taste its food. Whether you travel in Romania along the coast of the Black Sea or in the Dobrogea Plateau near the Danube Delta region or in the Province of Moldova or along valley slopes of the scenic Carpathian Mountains or in Transylvania Province or in Wallachia or in nearly any agricultural area throughout Romania, you're in wine country. 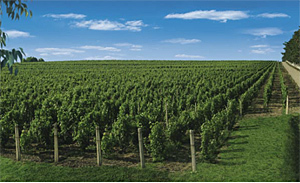 Romania is one of the world's top-ranking producers of numerous delicious wines, some of which never leave its borders. Romania 's climate and soil are hospitable to the production of many different types of wines, from dry, sparkling whites to rich, aromatic, purplish reds. Popular domestic grape varieties used for wine production include Frâncuşă, Fetească Albă, Tămâioasă, Fetească Neagră, Băbească. Frâncuşă – A very versatile soft, dry wine, crisp and lively, with just the slightest touch of sweetness. Fetească Albă – Semi-dry white wine, well balanced, with a distinct aroma reminiscient of the first flowering of the vineyard. Tămâioasă Romanească - A naturally sweet or semi-sweet white wine with subtle honey and basil aromas, an exquisite amber color and a persistent rich taste. Its sweet taste may also suggest a blend of rose petals and wild berries. Grasă de Cotnari – A naturally sweet white wine with a delicate fragrance and a smooth interplay of fruitiness and acidity. Galbenă de Odobeşti – A light white wine with a delicate bouquet that preserves the fragrance of the mellow grape. Fetească Neagră – Semi-sweet, medium bodied, light red wine, with original aromas. Băbească Neagră – Traditional full bodied red wine with a delicate bouquet and a slight taste of clove. Cadarca - this red, native variety , displaying a ruby-red color with a stinging taste of fresh clove, was the wine of the imperial court of Vienna during the reign of Emperor Franz Josef, in the 18th century. Romania also produces its share of worldwide vintages, including Riesling, Merlot, Sauvignon Blanc, Cabernet Sauvignon, Chardonnay and Muscat Ottonel. For the traveler interested in adding viniculture to his or her cultural itinerary, a trip to Romania offers many opportunities to visit wine-producing regions and to discover and sample the many different wines of Romania, from little known local and regional wines to Romania's great wine labels, such as Murfatlar, Cotnari, Jidvei, Dealu Mare and Odobeşti. Located in the Târnava valley ( Transylvania ), is known for its superb dry white wines. Wine tasting is offered at the 16th century Bethlen Castle in Cetatea de Baltă, located between Târnăveni and Blaj. 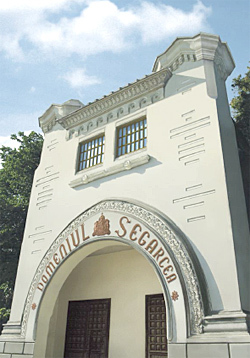 Located 150 miles southwest of Bucharest, Segarcea winery is known for its quality Cabernet Sauvignon, Merlot, Sauvignon Blanc, Fetească Albă and Italian Riesling. The Crown's Estate may be the only wineyard in the world which produces the "Tămâioasă Roză" (Pink Tămâioasă) - a fine rosé wine with a delicate aroma of candied peels of orange and grapefruit. Other domestic grape varieties grown at Segarcea vinayards include: Novac, Negru de Drăgăşani, Fetească Neagră, Tămâioasă Albă Românească, Fetească Albă, Crâmpoşie. Murfatlar, one of the most famous Romanian vineyards, is located just miles west from the Black Sea coast. Over 300 days of sunshine, along with cool breezes from the sea, make this area ideal for the production of sweet dessert wines, such as late harvest Chardonnay, Pinot Gris and Muscat Ottonel. Soft, rich red wines are also produced here - Cabernet Sauvignon and Pinot Noir being the most popular. (semi-sweet) - highly appreciated for preserving the flavor and freshness of the grape; and the sweet, golden Grasă de Cotnari, a noble aromatic wine with a nutlike savor and Tămâioasă. Odobesti is one of largest and oldest vineyards in Romania . Its most famous product is Galbenă de Odobeşti, a light white wine with a delicate bouquet that preserves the fragrance of the mellow grape. The wide variety of wines produced by the Odobesti includes five traditional sorts of Romanian wine, namely: Galbenă de Odobeşti, Plăvaie, Fetească Albă and Fetească Regală (white wines) and Băbească Neagră (red wine). Stretching on the hills of western Romania (Crişana), between Lipova and Pancota, produces the red, native variety Cadarca, displaying a ruby-red color with a stinging taste of fresh clove. 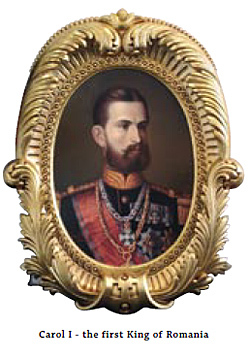 During the reign of Emperor Franz Josef, in the 18th century, Cadarcă served as the wine of the imperial court of Vienna. In 1862, at a wine contest in London, Roşu de Miniş (Red Miniş) was awarded the first prize. Pinot Noir, Merlot, Cabernet Sauvignon, Cabernet Franc and Cadarca are produced employing classical winemaking technologies, while the white wines like Italian Riesling, Traminer, Pinot Gris and Sauvignon Blanc, are obtained by using cooling zymurgy, resulting in fruity white wines of great finesse. Nearby Timisoara lies the vineyard of Recaş, with a history dating back to the 15th century. 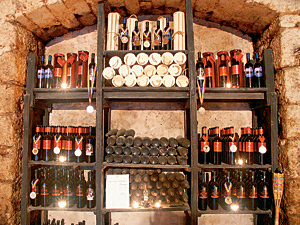 Some of the award-winning wines produced here include Italian Riesling, Fetească Regală, Muscat Ottonel/Fetească Regală, Sauvignon Blanc (white wines); Cabernet Sauvignon, Merlot, Pinot Noir/Merlot (red wines). "In this country anything is possible, yet at the same time everything is impossible". I was recently reading an article by Gisela Williams about Romania and this Romanian saying caught my attention. I have been once, in 1996, to this country located at the intersection of Central and Southern Europe bordering the Black Sea. It still remains one of my most amazing trips even though the infrastructure was not nearly as good as it is now. At the time I was only able to taste the Tuica, a local spirit (50% of alcohol) made out of plum. It was not until 2012 that I got the chance to discover the wine from this country. Romania and wine started their common history 4000 years ago (2000 BC) when the Greeks arrived from the Black Sea, making it one of the world's oldest viticulture regions (in comparison the Greeks introduced wine in France around the 6th century BC and it was further developed during the Roman time). Romanian wine has seen a great deal of history, from the legend of Dyonisus (the god of wine for the Thracians, also known as Bacchus) to phylloxera in 1880 (a sickness of the vine that wiped out a majority of europe's vineyards) and the communist era (nationalization of the wineries)… but Romanian wine got a second youth in the late 1990s when wineries were privatized. 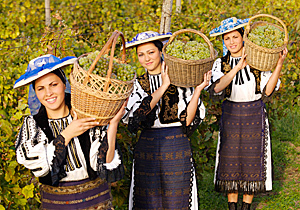 Today Romania is among the top 10 countries in the world with regard to area under vine and wine production. There are 7 demarcated wines regions: Transylvania (center of the country), Moldova (north east), Crisana & Maramures (west central and north), Muntenia & Oltenia (south), Banat (west), Southern Sands & Danube Terraces (south) and Dobrogea (south east); each of them containing a number of sub regions. The mix of a long wine history, the indigenous (Feteasca Negra, Babeasca Neagra…) and the newly imported grapes (Chardonnay, Merlot…) along with modern winemaking technology and passionate winemakers make Romanian wine very attractive. However, it is still not yet well known by the wine drinker and, unfortunately, Romanian wine is not yet easy to find at your local wine store. 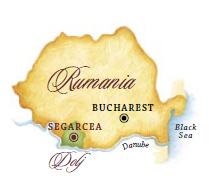 Our first wine stop will be in the south of Romania in the Oltenia region with the wine from Domeniul Coroanei Segarcea. This winery produces wine in a former royal estate located near the town of Segarcea. It presents the advantage of having a long wine history, the kings were actually producing wine in the same exact area, King Carol I first set up the vineyard in 1884, furthermore it is located in the same latitude as the Bordeaux, Burgundy and Piedmont wine area. In 2002 Cornelia, Mihai Anghel and family, took over the estate employing hard work, passion and of course financial investment to restore the winery and upgrade to the the latest technology. As a result of the combination of tradition, exceptional terroir and technology they have came out with the Minima Moralia line of wine. Let me tell you, I absolutely adore the wines from the Minima Moralia wine. When I look at a bottle I am always interested in the label, as this is the first thing you see in a wine store. Each type of wine has a face of a person in black and white, and each wine is named after a value that humanity was built upon: Hope, Gratitude, Respect, Devotion, Honesty and Honor. If I have to highlight only one of their wines, it would be the Minima Moralia Honesty. This is a blend of Viognier and Tamâioasă Românească, with golden yellow color and honey aroma from the indigenous grape and apricot flavor from the Viognier, definitely an elegant, refreshing wine. This is a perfect ambassador for Romanian wine and shows what Romanian white wine can be. We are staying with the same winery Domeniul Coroanei Segarcea but with a different line of wines. As I was mentioning earlier, the estate was established by the King of Romania and always produces a good quality wine. Of course since 1947 and the abdication of King Michael I, this country has no longer been a monarchy. However after the early 1990s and the end of the communist era, her Royal Highness Princess Margareta of Romania returned to her land and became an ambassador of the cultural renaissance of the country. As an homage to her, the winery has decided to produce a special line of wine Principesa Margareta. The white wine is a blend of Chardonnay, Pinot Gris and Viognier, with slight changes in the proportion depending on the vintage, but Viognier remains the main grape. This complex white wine has vanilla and plum flavors with a floral bouquet. From the South "west" of the country, we are now going East to the center of the Dobrogea plateau. 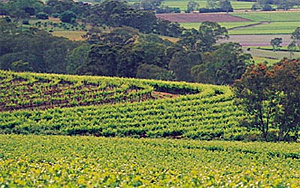 People have been growing vines and producing wine in this area for centuries. The Greeks and the Romans developed wine production in this part of Romania. Over the years various types of grapes have been planted in this area. This is where the Mulfatlar Podgoria (vineyard) is located, covering 3000 ha over 4 villages. The winery has a long heritage of winemaking, and produces several lines of wine, each one being for a specific segment of the market. The Trei Hectare "Collection" caught my attention. This reserve line is dedicated to the connoisseur and I have to say I enjoyed the Chardonnay. The label is attractive and the floral bouquet and rich fruit aroma are delicious. For the next wine we are going up north to the Moldova region. Senator is a winery that produces over 20 different types of wine, all of them split into different ranges of wine. One of them Monșer is dedicated to the wine purely made from indigenous grapes (pure Romanian vine variety: Feteasca Neagra, Babeasca Neagra, Cadarca, Babeasca Gri, Zghihara, eteasca Regala, Feteasca Alba, Sarba, Tamaioasa Romaneasca and Busuioaca de Bohotin), the pre phylloxera grapes. This line provides a very good understanding of what the Romanian wine were before the 1900s. 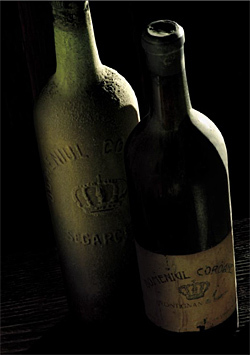 Of course since the 1990s and the privatization of the vineyard, the latest technology has been used for production, but this is still a fair ambassador of the taste of the past, of the Romanian Belle époque (reinforced by the note on the label: "Soiuri pure romanesti pentru boieri si obrazuri subtiri" - which means: "Pure Romanian varieties for bourgeois and thin cheeks"). The Şarbă is the name of one of the wine, but also the name of the grape used. This is a kind of blend between Riesling and Muscat types of grapes. It is not a sweet wine, but if you are a fan of Riesling, you will appreciate it: floral bouquet, exotic fruits and a hint of basil (a particularity of this type of grape). When I think about Romanian wine, I go directly for white, as in my opinion they can easily compete with white wines from other parts of the world. They are elegant, have flavor and are well done in general. The reds are different and I have mixed reviews for them. They are nice but need to open up a while before you start to drink them. Here are some wineries I have discovered with great potential. We are now exploring the west side of the country in the Romanian section of the Banat region (the region is split between Serbia, Hungary and Romania). People have been producing wine here since the Roman times and legend says that Bacchus spent his childhood here. Close to the city of Timisoara you will find the Recas vineyard. This area was already well known for wine production in 1447 and is where Cramele Recas winery is located. Since the beginning of 21st century, this winery has been modernized and the vineyard replanted in order to increase production and control the quality of the wine. Similar to other Romanian wineries they produce a large range of wines, each brand according to their specific target in order to cover the entire market. Of course I was mainly interested in the Exclusive Label and was pleasantly surprised by the Paparuda Rezerva Cabernet Sauvignon. As mentioned previously, you need to give the wine some time to open up, then you will start to have the full expression of the wine with some raspberry flavor among others. The wines from Romania are increasing their reputation in Europe, mainly in Germany, likely one of the reasons why Reh-Kendermann GMBH winery in Bingen (west of Frankfurt) decided to establish an estate in this country in 1994. (This is also probably why Germany is now the largest export market for Romanian wine). Our next stop is located in south west of the country in the Oltenia region, more precisely in the village of Oprisor Mehedinti county), the vineyard here was re-planted in 2001 in order to replace the old vines. The Carl Reh – Crama Oprisor winery here has 8 separates labels. Of course I would have loved to enjoy the entire range of their wines, but they were not all available at the tasting. My main discovery from this winery was the La Cetate Cabernet Sauvignon. Aged for 12 months in French oak barrel (the ambassador of the winery mentioned that they had tried the American oak but it didn't match the style of the wine they were looking to produce), you will find some light coffee and strong black currant flavor. Senator winery is producing wine from 4 major vine-growing areas of Romania: Husi, Insuratei, Vrancea (all three areas being located on the East side of the country) and Tirol (west side of the country). As I was explaining previously they produce over 20 types of wine, under different brand names. The Senator Private Collection was created to display their best wine. For the winemaker, the best way to evoke their best expression was to blend the different type of grapes. The Red wine from the private collection is a blend between Merlot (60%), Cabernet Sauvignon and some local grapes such as the Feteasca Neagra. Violet flavor and red fruit flavors are the particularity of this wine. For the last wine we are going back to Podgoria Murfatlar. 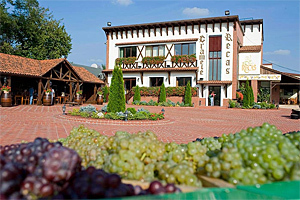 This large winery represents 33% of the Romanian wine market, mainly because they offer a wide range of product. Over the years they have invested over 50 m euro in renovation, innovation and have created several labels to cover the need of each market segment, even the niche markets, such as hotels and restaurants. For the red wine I paid particular attention to their latest wine: Murfatlar M1 Syrah Semidry. From the label to the taste this is definitely a bottle that will cause a reaction, good or bad, this is your own choice, but honestly this is a happy surprise. This is not the typical expression of the Syrah, you will find the flavor to be light with a hint of red berries. To conclude we are going back to Domeniul Coroanei Segarcea winery, in Segarcea. As I explained earlier, this vineyard was created by the King of Romania in 1884. One of the particularities of the estate is that it is split in the middle by the railroad of the royal train. This gave the owner the idea to create a brand named Blue Train. The blue train was the name of the train of the kings, carrying them toward their duties over the course of the 20th century. I had two tastings on the same day of the Blue Train Feteasca Neagraand I have to say my first impression was not very good. Somehow my opinion improved with the second glass (both were from different bottles). But the last one was very good and I really enjoyed the black currant flavor of this delicious wine. If you find any of these wines in a store or wine list, you should definitely pick one up. You will be pleasantly surprised. They are still for the moment difficult to find but I hope it will change soon.